There are few places with better dive sites than the Caribbean. In fact, some of the world’s most renowned reefs, walls, caves and wrecks are found in these extraordinary waters. With state-of-the-art Newton Dive Boats, a PADI® Certified staff and unparalleled dive locations, it’s no wonder we’ve been voted one of the Top 5 Dive Operations in the Western Hemisphere by PADI®. In fact, we’re responsible for over 100,000 PADI® certifications on resort. Even if you’ve never dived before, this on-resort experience is a great way to explore the underwater world. This short 3-hour program (for a nominal fee) will qualify you for one open water dive (max 40 ft.) during your stay. 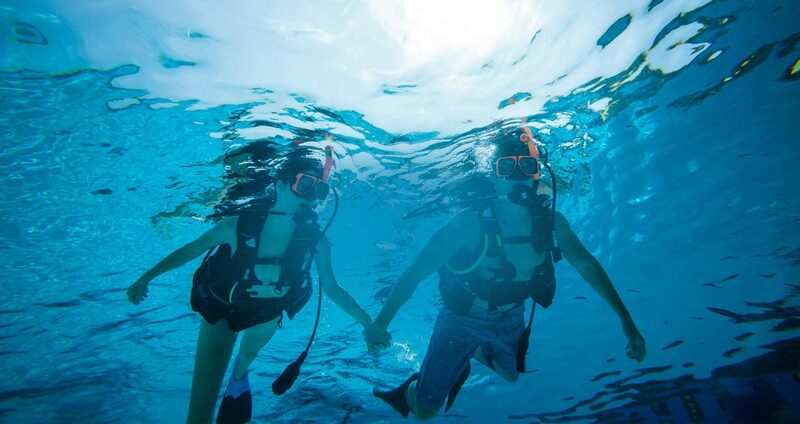 At Sandals when we say we include SCUBA, we mean it! If you're a certified diver, we let you dive every day (except your departure day) – twice a day with one tank or once a day with two tanks. We provide you with the most comprehensive diving program, voted by PADI as one of the Top 5 in the Western Hemisphere. We use the very best equipment, the best dive boats, PADI–trained staff and the most dive sites. Best of all, it's all included!